And so we face the final curtain…. Anyone in the area around our site may have seen our mucky wellingtons trudging up and down Cannon Street over the past week. That is because we are back, digging the final area! The current area of excavation is adjacent to our main area in 2012/2013, although the basement of the 1950’s building extended much further into the ground in this part of site. This means a lot more of the archaeology was removed by construction 60 years ago. 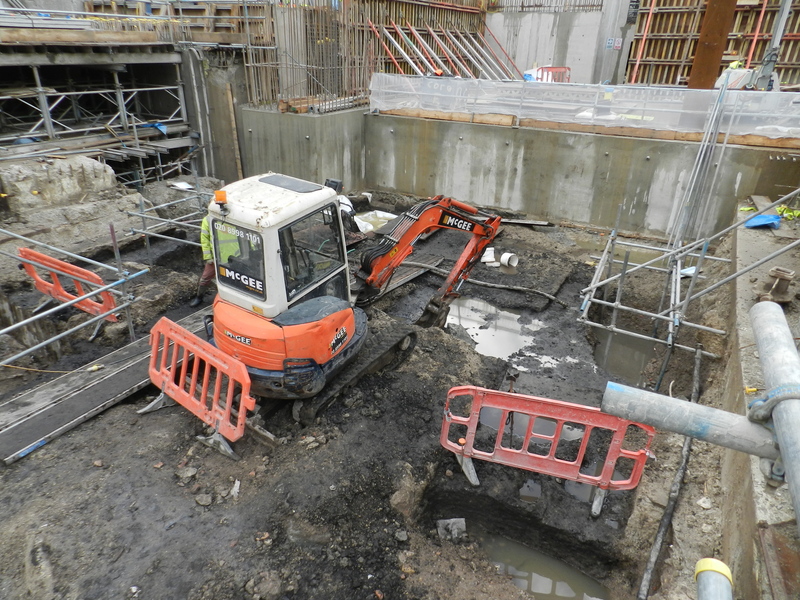 Before the excavation could begin there were two weeks of enabling works; McGee’s broke out the existing concrete basement slab for us and cleared any rubble from the site. This is all done under archaeological supervision. 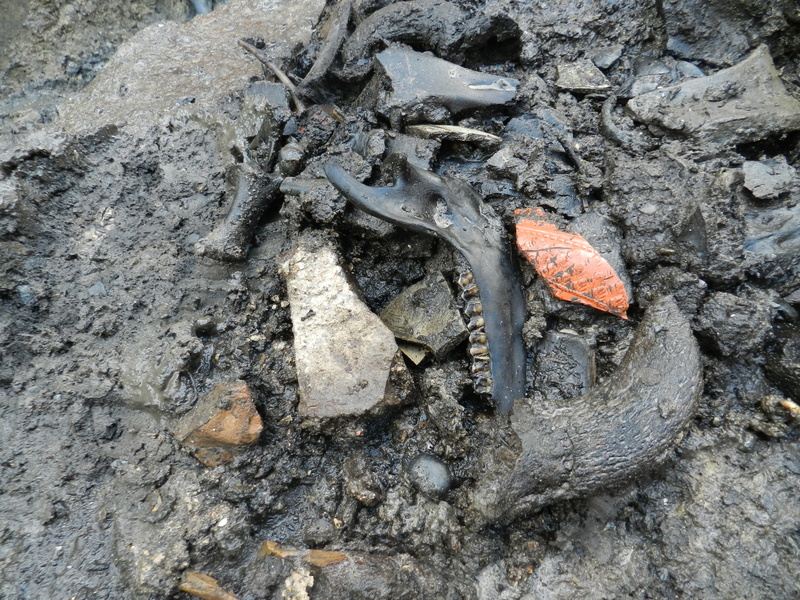 The area was then cleaned carefully using a small machine and a machine bucket with a blade instead of teeth. This removed any modern material and revealed the dark Roman muck underneath. All the timber buildings, similar to those seen before, are long gone. We are left with the earliest Roman deposits on the east bank of the Walbrook channel. These deposits were the Romans’ first attempts at building up the land to combat the wetness and to provide a sturdy platform on which to build. The Romans appeared to use rubbish to build up the land in this area, and its rubbish that often contains the best stuff. Broken pottery, animal bone, old rings, pins, broken writing tablets and tools are among some of the initial finds from the deposits. We do have number of vertical timbers poking through, which are likely to be piles driven in from a higher level. 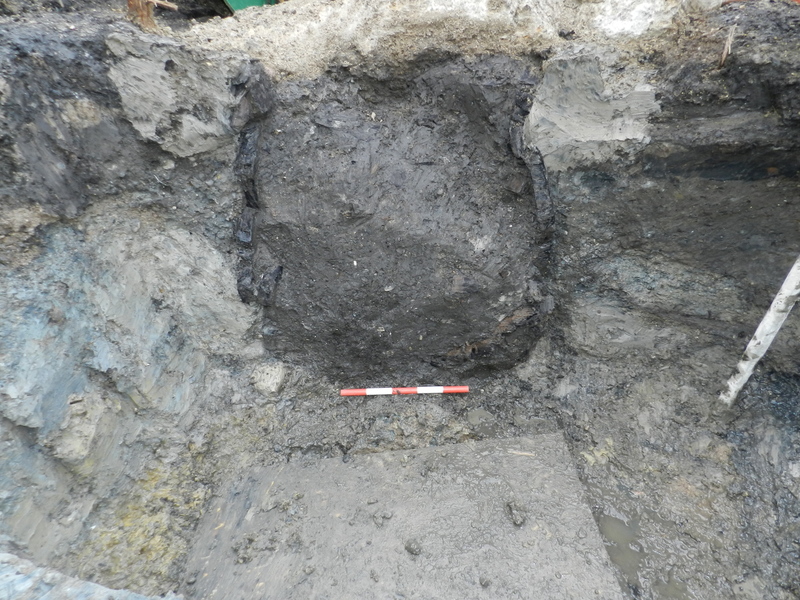 We also have the lower levels of a timber well; hopefully it will still be as impressive as the ones previously excavated. So far the site has been cleaned up and a site grid established so we can plan and recorded the deposits. And Pat is back metal detecting so we shouldn’t miss a thing!